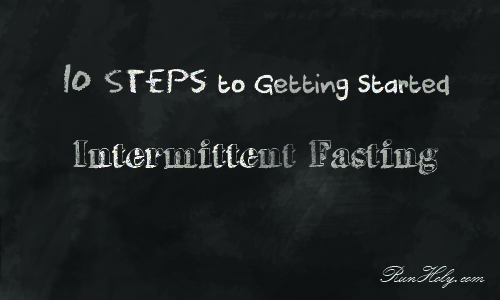 Getting started intermittent fasting can seem intimidating. After each of my pregnancies, I have used IF to lose the baby weight and regain control over my crazy eating, but I find myself a little afraid gearing up to get ready to start intermittent fasting again after this pregnancy. Even though I know what I’m in for, the intimidation factor is still there. I don’t know if I’m writing this post more for you (the reader who wants to know about getting started intermittent fasting) or me (the girl who needs to be reminded as I get ready to launch back into this life style). Pick your Intermittent Fasting Protocol based on life, personality, and goals: I have a very full list in my free intermittent fasting planner here. Choose the one that fits your life. If you are a morning person and like to workout and then need to eat right away or if you work out mid-morning and like to eat before, then you may need an eating window that starts earlier in the day like 10am-4pm or something like that depending on the protocol. It may be easier for you to skip an entire 24 or 48 hours, get it out of the way, and then not have the pressure of fasting weighing on you. So, you would want to choose something like Eat Stop Eat. There are also protocols that allow you to have 500 calorie meals on fast days if you just cannot imagine going an entire 24 hours without food. And also “warrior diet” will allow you to snack on specific foods throughout the day. Also, what are your goals with fasting? Most people it is to lose weight. But for some it may be to simplify your life – i.e. not be meal prepping, cooking, eating 6 or more times a day. For some it may be for building muscle. Others for the life quality, longevity, anti-aging. Going in, you need to know what your goals are. For example, one 24 hour fast a week may not help with losing weight, but it will help with weight maintenance and longevity, anti-aging, blood sugar regulation, memory, and body cleansing. And 16-8 has been shown to benefit those looking to gain muscle. So, you will want to choose your protocol based on your goals. My motivation is a combination of goals, but mostly weight loss. I enjoy the feeling that fasting daily gives me so I choose an intermittent fasting protocol that has a limited eating window each day. I enjoy also the simplification of lifestyle that eating only once or twice allows. I also enjoy eating large, satisfying meals. Whatever your goals, I would write them down. Write down your goal weight if it’s weight loss. Measurements of areas that you want to grow in muscle size. If you want to feel more energetic and creative. Those types of things. Write them down so that you can look at these goals and remember Why the heck you are hungray! 1b. Adjust your eating. This isn’t exactly necessary, but I have to make this recommendation. One of the great benefits to intermittent fasting is that you can include some “crap” in your diet and still lose weight because you are eating less calories. BUT…it would be a good step to begin fasting to start cleaning up your diet so that before you get started intermittent fasting you are informed about healthy eating and already making healthy choices. It would be easy if you did not make eating healthy (not high in processed, sugary, fast/restaurant foods) a priority to have a more difficult time losing weight and reaping the benefits of intermittent fasting. You would probably have to limit your eating window to something very small and your body would be slowed/working overtime in the process of detoxification during fasting times. Unhealthy eating has an affect your energy, blood sugar, mood, hormones and all of body systems whether you are intermittent fasting or not. Now, I do believe that as you begin intermittent fasting your cravings for unhealthy foods will diminish. I also believe that if you were to continue eating unhealthy foods, intermittent fasting would be a tool to help your body against the ill affects of such food choice consequences. That said, working towards cleaning up your diet prior to getting started intermittent fasting would be my suggestion (or at least have it as a goal in your mind as you begin IF). 2. Research. Either before or after you pick a IF protocol, research the crap out of it. See what benefits others have received from following that protocol. Read about what intermittent fasting does to your body, mind, life, etc. If you go into the fasting way, equipped with the knowledge of what that hunger period is doing for you, it’s easier to persevere during the time that it is difficult. The 8-Hour Diet: Very easy to read and has a helpful list of ways to distract yourself during the fasting window. The Fast Diet: also called 5:2 involves eating 500 calories on fasting days. Also includes a lot of 500-calorie recipes. The Every Other Day Diet: The author gives a lot of studies (human studies, which is kind of rare) that will help fuel your faith in IF. Easy to read also. Eat Stop Eat: Kindle version. I have admittedly not read this book because I’m not very interested in going 24 hours or more without eating. But Brad Pilon is a pioneer in the IF world. Basically, once you pick your protocol or narrow it down to a couple, you can find a book or resource on it. Ori Hofmekler (warrior diet) and Martin Berkhan (leangains) are two of the other IF pioneers that have good info on their blogs. A great website to find new research on intermittent fasting is Dr. Mercola’s site. I like to read the articles on his site like this one just to remind myself how awesome IF is and why I should keep at it. Also, the fasting twins on youtube are hilarious although a little vulgar. They answer a ton of questions that you may have getting started or while you are intermittent fasting. Knowledge serves as fuel and motivation so it’s good to arm yourself going in. 3. Get tools if you need them. Even if you don’t think you will need them, it might be good to grab some of the free ones going in because what is there to lose? Intermittent fasting is all about finding what works for you basically through trial and error and adjustments until you find your unique flow. My Fitness Pal: Okay so not exactly for fasting specifically, but awesome for tracking macros, calories, workouts, etc. Or if you are a pen and paper kind of person like I am here is the link again to my free, printable intermittent fasting fitness planner. It has specific areas for goals, measurements, meal planning, and daily eating windows. Or here is a diet and fitness planner not specifically for intermittent fasting, but would work. Maybe other tools would be supplements like bulletproof coffee (basically good coffee, GHEE, and coconut or MCT oil) or BCAA’s. These supplements have both been shown to help with hunger and the lack of energy that you may feel at the start while you are first adjusting to intermittent fasting. There are pre-workout and recovery supplements that have BCAA’s in them. I’ll have to do another post on these two supplements BPC and BCAA’s. Message me if you need more info. 4. Start the transition. Unless you are an all or nothing kind of person and that’s just what works for you, then I suggest easing into intermittent fasting. Meaning…start delaying your first (breakfast) meal and start cutting back how late you are eating. Intermittent fasting is just as much or more of a mind-thing. By delaying just an hour or whatever you can handle and stopping at an earlier time at night, you are beginning the training of your mind. I believe this works like a muscle: start with a lighter weight (a shorter fasting amount of time) until that is easy for you, and then move to the next “weight” by lengthening your fast time. And this begins the process of intermittent fasting. Depending on your goals, you continue modifying your eating/fasting window length until you are seeing the results that you want and it fits the life style that you want. After I have a baby, I usually have to adjust my eating window to between four and six hours to lose weight at the rate that I like which is about 3-4 lbs a week. Also, the slow increase in fasting time gives my body time to adjust to fasting while breastfeeding. It’s also a good idea to tell those close to you what you are doing. You may be a little grumpy starting out and will need the patience and understanding of those you love. Explain what IF is all about to them and why you are doing it (another reason #1 and #2 are important). They may even want to try it with you…if so, awesome! But if not, maybe they could at least not invite you to lunch, bring over donuts, or snack on delicious things at night right next to you. 6. Consider toning down your workouts and adjusting times. The first couple weeks are the most difficult when you begin intermittent fasting. While I don’t recommend stopping working out as it is very effective as a distraction tool against hunger, consider taking a walk instead of a run or HIIT workout (<– LOVE this one btw). Or maybe lower your weights/reps at the gym. Your energy will come back after the beginning transition period, and you will probably find you are able to work out as hard or harder than you did before in a fasted state. But at the beginning, you will feel like your limbs are weak and lack the motivation, energy, and strength to do as much. Also, it will increase your hunger about an hour after a hard workout, so you don’t want to sabotage yourself if your eating window doesn’t begin until many hours after your workout time. You may also want adjust your workout time so that it is later, earlier, whatever. Some may need to move their workouts to within their fasting windows (middle or end) so that it will distract them from hunger, get those satiating endorphins flowing, alter blood flow away from the digestive organs, and get the dopamine release that you would usually get from food. This gets some through the hardest points. Some may need to move the workout time to the end of the fasting window so that they don’t have to fight against the hunger beast that hits you an hour or so after. The time you workout will end up being unique to your needs, personality, and lifestyle. 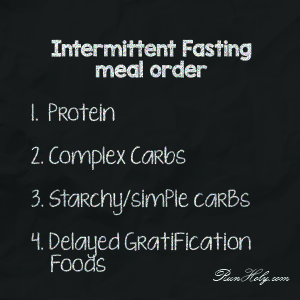 Find what works for you within the intermittent fasting protocol that you choose and practice. 7. Use delayed gratification. When my daughter ask me for a sucker or maybe she wants to go to the playground, I often use delayed gratification. Even for a 3-year old this works! “Not now, but probably later” will ease the pain of her desire. This is a great tool of yours for intermittent fasting. During your hungry times, you will have co-workers bring in donuts. You will see the frosted mini-wheats and milk that your toddler is eating, and your mouth will just drool. Your mind will begin to try to convince you to give in. USE delayed gratification. Tell your mind, “Yes you can have that…donut…bowl of cereal…just not now. You can have it later if you want it. Sometimes I even write down items that I denied myself that I’m going to have during my eating window. This is also a good tool to get it off your mind and prevent obsession. 8. Protein and complex carbs first. With #7 said, I have to give you probably my best advice, eat your protein and complex carbs first. You may have donuts, chips, bagels, and candy on “your list”, but if you eat those first it can cause some problems. You will overeat those items meaning higher caloric intake, less nutrients, and probably a tummy ache. It’s better to have a meal planned that includes a protein and some kind of complex carb. Chances are you will be craving these things anyway by the time you reach your eating window. But eat your fill of grilled chicken, or lentils, or beef and broccoli or kale chips or spinach (man! I’m really hungry) then move on to things like baked sweet potato, potato, corn, rice, whatever starchy carb…Then AT THAT POINT, have something or everything you can handle on your DG list. 9. Before photo. My last tip getting started is to take a BEFORE photo. I have some very impressive intermittent fasting before and afters. This helps me to get started after each pregnancy is done and it’s time to begin my postpartum weight loss because I can see the results I’ve gotten before with IF. Also, with IF you tend to gain muscle pretty easily due to its effects on growth hormone. Therefore, the shape or tone of your body changes even faster than the scale does. 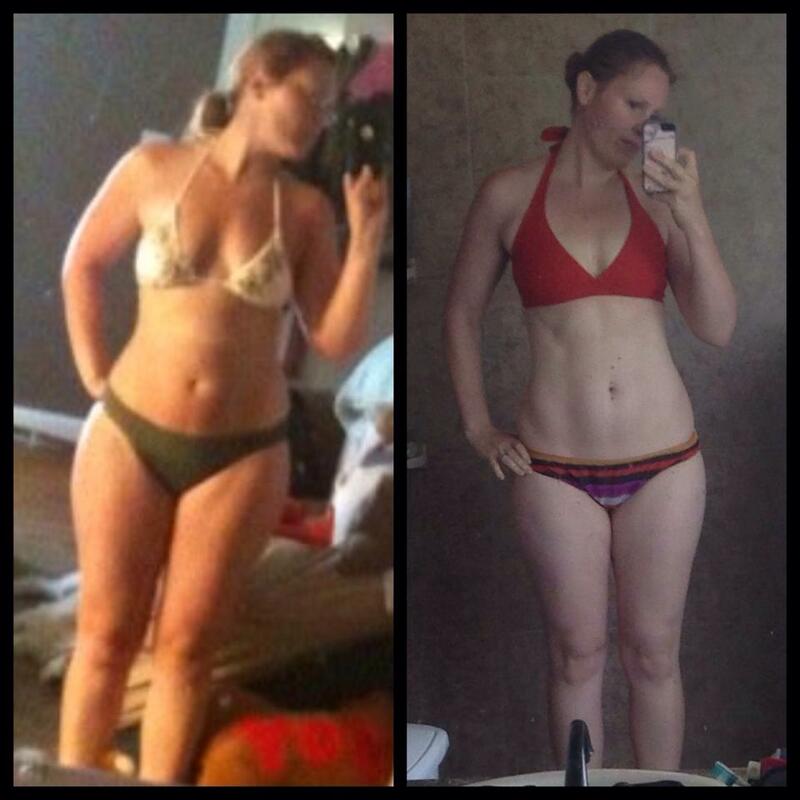 Progress pictures will help you to stay focused and driven while intermittent fasting. 10. Keep in mind. I have to tell those of you reading this who are just getting started intermittent fasting or just starting to consider giving it a try that the first part its the hardest. Please as you begin, keep in mind the first 10 days to 2 weeks are the most challenging. If you can make it through this time, it gets much easier. I find that after this period, I actually don’t experience hunger the way that I did before and my cravings and appetite (the amount I can eat) drastically change and decrease. I have heard the same testimony given time after time in my intermittent fasting group on facebook. Some women only have a few days where there body and mind adjusts, and it just feels natural. Seriously, you will reach a point where it just feels like you’ve always eaten this way. Maybe you are just curious about this whole intermittent fasting diet thing you’ve been hearing about. Maybe you’ve looked into it and you’re not sure how to go about getting started intermittent fasting. Or maybe you’ve tried to start and failed. Whatever the reason, I hope this post will help you feel more confident getting started intermittent fasting. Feel free to comment with questions below and also post in my intermittent fasting group. Any questions you have, I will be happy to answer if I can or send you to the right place if I can’t. I can also use your questions to fuel post like this one. Intermittent fasting has been a great choice for me and I’m so glad I found it. I think it can improve the quality of life for so many. That’s why I enjoy helping. I hope that you are able to make IF work for you and are not intimidated about getting started. It’s totally worth it, and the benefits are crazy awesome…so much more than weight loss. Interesting read. I like the idea of practicing delayed gratification – even if not fasting, it might help control cravings. I never knew there were so many different ways to fast and I never would have considered delayed gratification for anyone other than my children but it makes so much sense! Thanks for sharing. This sounds like it would be very beneficial and seems doable. I like that you offer a free intermittent fasting planner too. Wow, this is really great! Detailed, and some really great tips here! This is very interesting. Thank you so much for sharing. I have never thought of using delayed gratification before. This post so educational. I really learned a lot. Never knew so much was involved in fasting. I haven’t heard much about this, but it is quite timely. I have heard a lot about fasting for spiritual reasons, but many of the tips could still apply. I need some shaping up too! For some reason it is easier for me to go cold turkey sometimes rather than allow myself a little bit of something I like. It would probably help me get in the right mindset. Thanks for all the free planners and tips. I’m pinning for later/soon! Wow I had never thought of using intermittent fasting as a weight loss tool. Were you breastfeeding when doing it? Thanks for linking up with Fitness Friday on Drops of Learning. I hope to see you back today! Hello! Great job and thank you for sharing and helping to spread the word about I.F. I have been an I.F.-er for 1.5 years now and I have lost 50 lbs. It is the only thing that has worked for me and I have decided that I will never look back. I am an intermittent faster for life. Finding out about this has truly been a blessing for me. God’s blessings to you and I wish you continued success.